Hailing from Athens, Ohio, SKELETONWITCH first got their feet wet when Scott Hedrick heard demo tracks from SERKESORON, his college mate Nate Garnette's former band, which prompted their legendary debut, "At One With the Shadows," a facemelting crossover of thrash and black metal with progressive undertones. The band would go on to sign with Prosthetic Records and release four more albums, eventually with renown producer/musician of Kurt Ballou of CONVERGE. After the unfortunate departure of the founder and Vocalist, Chance Garnette, fans have been rightfully skeptical about the next step SKELETONWITCH takes. It has clearly upset many people that the band has ventured away from their thrashy and progressive roots, but the change of pace is not a bad thing at all. In fact, the quintet is presently pumping out some heart-wrentching atmospheric black metal that can compete with the likes of veterans like ENSLAVED. With the addition of ex-VEIL OF MAYA vocalist Adam Clemans, it is indeed a new era for the the much adored dark metallers. The album opens with shimmering staccato and melody that adds a lot of nuance to their repertoire. "Fen of Shadows" is an eight minute emotional undertaking that explores all the atmosphere that is to come. "When Paradise Fades" presents a melodic journey through the wastes, with all the tremolo picking, blast beats and militant, raspy vocals most come to expect from black metal. "Temple of the Sun" fleshes out a galloping war cry with stomping skank blasts and a chorus that will be stuck in your head for days to come. The Title track of the album darkens the mood a bit, with a down tempo, reflective track that bleeds melancholy. 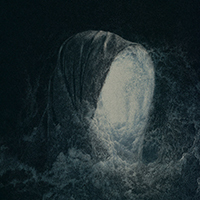 "Devouring Radiant Light" exemplifies the exact direction SKELETONWITCH intended to go with layered, melodic riffage that couples well with the audible lyrics which are littered with existential philosophy. Following Clemans since his days in early VEIL OF MAYA, it is truly satisfying when a vocalist reaches their peak and you can actually understand what they are saying. "The Vault" again darkens the mood with cleanly layered, depressive guitars, entering a down-tempo escapade of melancholic chord progressions, never compromising the classic black metal sound for the entire nine minutes. "Devouring Radiant Light" has clearly pissed off a good deal of fans, but objectively listened to, it stands on its own as a pillar of atmospheric black metal and is only good news of things to come. Who wants the same record over and over?